Get inspired for your Pompano Beach kitchen remodel looking at these awesome kitchen designs and decorating ideas! With so many styles, options, colors and appliances to choose from where do you even begin when planning your perfect kitchen remodel? It’s not always easy to make every last decision and so we recommend going with your gut. It’s sort of like finding true love. When you see something that makes your heart skip a bit, don’t dismiss it because it might just be the one. See what makes your heart palpitate by scoring these awesome kitchen inspirations from around the web. Kitchen cabinets can make or break a kitchen, as they have a huge impact on the overall look, feel and even functionality. That doesn’t mean you have to play it safe and go with the basic colors and styles all of your friends and neighbors have. Don’t be afraid to play around with cabinetry. For instance, the rustic kitchen pictured below might seem like too much wood to some people, but to others it reflects a true rustic paradise. Transform the inside of your cabinets to look as pretty as the outside using fabric, easy to apply stick-on wallpaper, or even paint. This is an especially good idea if you have open-faced or glass-faced cabinets. Make your cabinets stand out by transforming unused space into an entertainment center. This gives you the perfect opportunity to cook along with your favorite cooking channel chiefs. It’s also a great way to still use stock cabinets in unconventionally sized spaces as opposed to paying extra for custom cabinets. Another awesome way to incorporate the colors of the ocean is with your countertop colors. For instance, this blue-accented recycled glass countertop is heat resistant and beautiful! 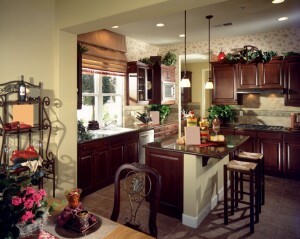 Granite also offers a world of color options, plus long-term durability, beauty and a high-end look. We couldn’t leave the kitchen backsplash out of the mix! This is a great place to incorporate colored tiles that speak to an ocean-blue theme. When remodeling your kitchen you want to make the most out of it, in other words it shouldn’t just look pretty but it should be practical too. For instance, you could transform a small and slightly dysfunctional walk-in pantry into a storage haven that literally comes to you. Another way to get more out of your kitchen is to add cabinets in unexpected places. For instance, cabinet siding is often unused and walled up with wood, but that doesn’t have to be the case. If you go with a custom design you could create the perfect space to store your cleaning supplies, like brooms, mops and dusters. These items are thin, so while the space might not be big enough to fit a pantry full of food or even dishes, these items fit easily, neatly and most importantly provide added convenience. If you don’t have the right cabinets or a big enough budget for the idea pictured above you can still make use of your side cabinets by getting crafty. For instance, use it as a place to store papers, business cards, and writing utensils, as opposed to overflowing that junk drawer that could better serve as a place to store kitchen utensils. Add a pull out drawer beneath your stovetop and you’ve got the best place in the kitchen to store spices. The drawer doesn’t have to include too much depth. Even if it ends up being too shallow for some of your spice containers you can always transfer spices into slimmer containers that will fit. It’s not just the larger elements that make your kitchen the envy of all your guests. There are little things you can add to your kitchen to make it that much better. For example, clean up your countertops by creating a soap station near the sink like the one pictured below. Not only does it look super cute but it also keeps your countertops clean of soap scum. Add fancy lighting fixtures to your kitchen to give it that extra pop of pretty that also serves a purpose, more lighting! There are countless sites that offer gorgeous chandeliers at extremely discounted prices, turning $1,000 chandeliers into $150 deals. Remodel your kitchen with Tops Kitchen Cabinet and you will have the extra money you need to make your space that much more special thanks to our affordable wholesale prices.